42.28 How do I change Internet Proxy Settings? > How do I change Internet Proxy Settings? Active Provider - Specifies the settings profile to be used when opening connections. Choosing the Direct provider causes all the connections to be opened without the use of a proxy server. Selecting Manual causes settings defined in Eclipse to be used. On some platforms there is also a Native provider available, selecting this one causes settings that were discovered in the OS to be used. Proxy entries - The table displays entries that are available for all providers. Checkboxes in the first column of the table indicate entries to be used for the currently selected provider. Proxy bypass - Use this table to specify, either by name or pattern, the hosts that should not use any proxy. A direct connection will always be used for matching hosts. Checkboxes in the first column of the table indicate entries to be used for the currently selected provider. 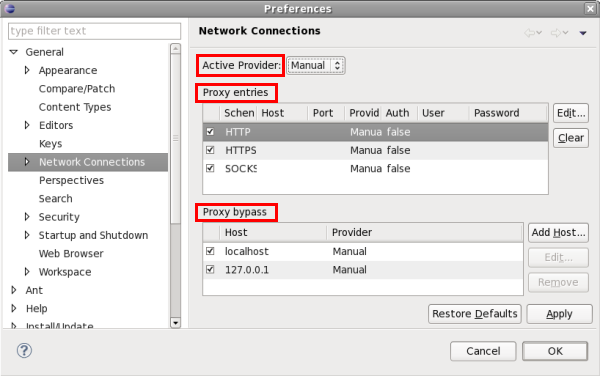 When using Manual proxy provider there are three predefined schemas to set settings for: HTTP, HTTPS and SOCKS. Configuration for each schema is displayed in the Proxy entries table. To edit settings for a particular schema double-click the entry or select the entry and click Edit... button. If Port field is left blank default port number will be used: (HTTP - 80, SSL - 443, SOCKS- 1080).